Trickle down seems to be one of Sony's major CES themes: Bringing features from higher-end products down to its cheaper entry models, like its new entry-level Cybershot DSC-W220. Specifically the W220 pulls its tricks from the W150 and W170—namely Sony's Intelligent Scene Recognition that picks the right auto-shooting mode for you, and a Dynamic Range Optimizer that tweaks the contrast and other settings automatically. Those were $300 camera features, the 12 megapixel W220 is about $190, which is still kinda pricey in the grand scheme, since you've got $140, $150 camera running around from other companies that do roughly the same things. 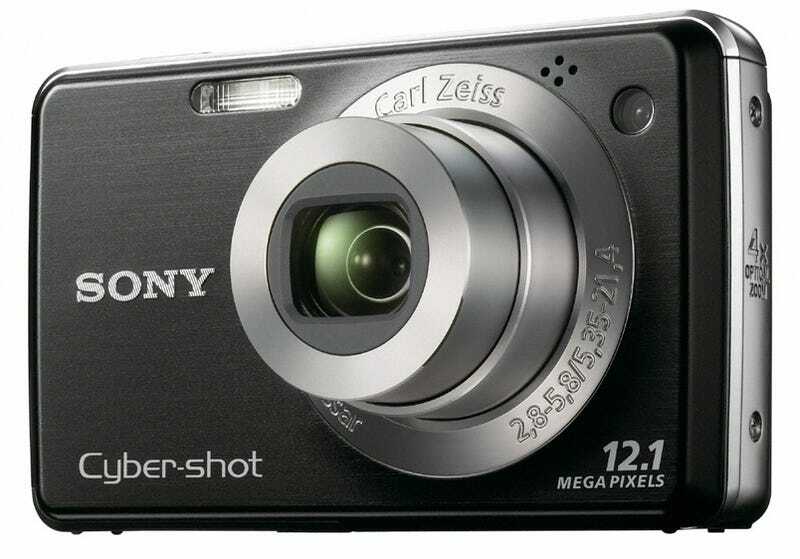 LAS VEGAS (CES Booth #14200), Jan. 7, 2009 – Sony today announced a new 12-megapixel Cyber-shot® camera (model DSC-W220) that combines powerful imaging features with intelligence to make taking great pictures easy. Intelligent Scene Recognition automatically recognizes a total of five scenes—twilight portrait, twilight, twilight using a tripod, backlight and backlight portrait. It optimizes camera settings for shooting situations, taking an additional shot in low and bright light scenarios when there are two different approaches to shooting a scene so users can choose which picture they would like to keep. The camera’s Dynamic Range Optimizer uses a sophisticated algorithm to determine the best exposure and contrast settings in almost any shooting environment, giving images a natural look with clearer details that match what you see with your naked eye. The W220 camera has a 2.7-inch LCD screen (measured diagonally) and Carl Zeiss® Vario-Tessar 4X optical zoom lens with 30 millimeter (equivalent) wide angle view. It includes Optical SteadyShot™ image stabilization to minimize blur without affecting picture quality. Sony’s Smile Shutter™ technology automatically captures a smile the moment it happens. You can use the adult or child priority setting when shooting scenes containing both adults and children, and the camera will distinguish one face from another. Images can be stored and managed on both the camera’s 15MB internal memory and an optional Memory Stick® media card. The camera’s high definion output and HD slideshow with music let you share images on HDTV sets, including Sony’s BRAVIA® flat-panel LCD models (HDMI cable not included). The DSC-W220 camera will be available tomorrow in silver, black, pink and blue for about $190. The camera and a range of accessories, including new carrying cases (models LCS-CSVA, LCS-CSVB and LCS-CSVC), can be purchased online at sonystyle.com, at Sony Style® retail stores (www.sonystyle.com/retail ), at military base exchanges and at authorized dealers nationwide.